Our connecting rods are designed to directly replace the OEM MPE 750/850 rod assemblies. They fit into the original crankshaft & piston without any modifications. The rods a precision, high strength, quality piece that reflects the optimum balance between lightweight and durability. The custom designed material, meets all VAR (vacuum arc re-melt ASTM standards). The heat is validated, both by the supplier and an independent metallurgist whom confirm the desired physical and chemical properties of steel. The H beam configuration is the stoutest beam configuration available, and is designed for High load / High Rpm / Turbocharged applications. It is capable of handling the most abusive forces in an engine, and is available in different lengths for versatility. The re-useable connecting rod bolts have a 285,000 psi tensile and is good for virtually indefinite torquings / assemblies. A final certified 200% shotpeen operation completes the part. 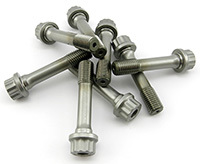 The rod bolts require a 12 point socket for removal and installation. Many mechanics might have this in their toolbox, but only as a small 3/8" drive that isn't strong enough to correctly apply the torque needed. 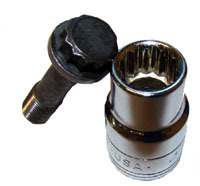 This Â½" drive socket will fit correctly on most torque wrench's and will withstand many years of use. Our special bolts have very high tensile strength; but they should be replaced after 15-18 torqueing's/assemblies. You will need (2) kits to replace bolts in both rod assemblies, as there are (2) bolts per kit. The replacement Rod bolts for our CR-Series rod kits only. They are not designed for use with OEM rod assemblies.